The topical application of fluoride is proven to strengthen teeth and to reduce the likelihood of the development of dental decay (known colloquially as “cavities”). Our dedicated hygiene team applies topical fluoride to pediatric patients and adult patients when indicated to accomplish these objectives. Our overall goal is for patients to walk out of our dental office in Orange, CT knowing they don’t have to return for 6 more months! Strong 5% concentration of fluoride allowing for immediate effects to the teeth. Unique formulation allows the patient to eat and drink immediately after application. 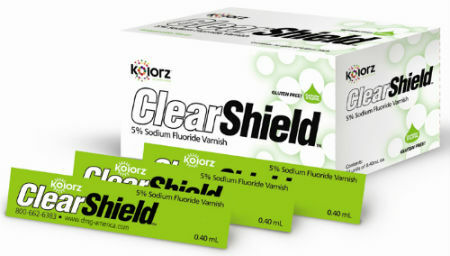 The varnish is sweetened with xylitol which is clinically proven to reduce dental decay as well. White color similar to enamel so it is nearly invisible. 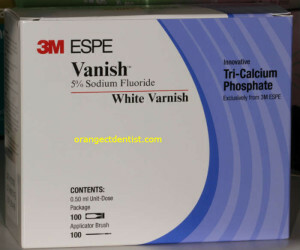 The varnish contains the unique Tri-Calcium Phosphate component which has been demonstrated in several scientific studies to aid in the remineralization of tooth structure. We were the first dental office in Orange to offer a gluten free dental visit! Gluten free dental visits include the use of a gluten free topical fluoride pictured above. For more information on our ability to treat patients with Celiac Disease and Gluten Intolerance, see our page on Gluten Free Dentistry. Please note that the topical application of fluoride is entirely different than the systemic use of fluoride. Excess consumption of fluoride systemically can lead to fluorosis. Topical application of fluoride to teeth on pediatric patients every 6 months has never been found to be correlated to fluorosis. Please call our office in Orange, CT if you have additional questions about the differences between topical versus systemic fluoride.